Queen butterflies (Danaus gilippus) look very similar to monarch and viceroy butterflies, except the wings of queen butterflies are darker brown with white dots. 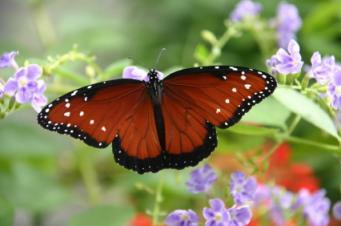 Queens also don't have the thick black veins running through their wings like monarchs and viceroys do. Queen butterflies do have veins in their wings, but they are not nearly as thick as those of the monarch and viceroy butterflies. 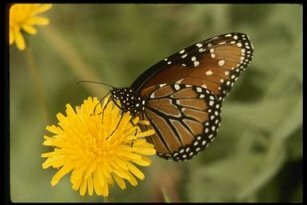 With a wingspan of just a little over 3 inches (8 cm) they are also slightly smaller than monarchs and more similar in size to viceroys. 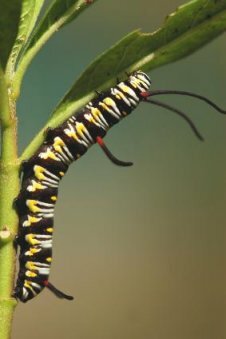 Queen butterflies belong to the family Nymphalidae, which also includes the monarch and viceroy. This is a family of butterflies known as the brush-footed butterflies. What this means is that their forelegs look more like brushes than legs. In fact, their forelegs are so thin that they are not very useful for walking. Queen butterflies can't withstand cold weather and so their range is from the western and southern United States down to Central America. They are rarely found in the midwestern states.